So you’re missing teeth, and you know you want dentures to complete your smile. That’s great — but now which option do you choose? The ultimate decision is up to you, but we can provide you with all the denture information you could hope for so you’re totally informed when it comes time to complete your smile at Independence Family Dentistry. Keep reading to learn all about your denture options from the expert in tooth replacement, Dr. Danny Nakhla! Dentures are prosthetic teeth that look, feel and act just like the real thing. Today’s dentures come two ways: implant and non implant-supported full or partial dentures. What does that mean, exactly? Let’s take a closer look at each to find out. When you choose to stabilize your dentures with dental implants, you’re giving your new teeth the stability they need to stay in at all times — and you’re giving your jawbone the stimulation it requires to remain healthy. 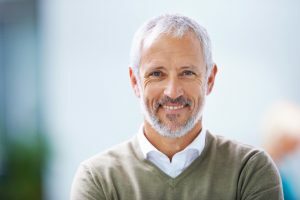 The process for dental implants is longer and more invasive, but the result is a set of dentures that gives the look and feel of your natural teeth a real run for their money. Patients who choose dentures that snap in or are bonded with dental adhesive enjoy the fast, budget-friendly aspects of this option in tooth replacement. This type of denture looks and acts just like your natural teeth, but may need to be refitted as the years pass due to the degeneration of the jawbone. When you decide that dentures are the right tooth replacement option for you, Dr. Nakhla will advise you on whether you need a partial or full denture. Partials replace several missing teeth from spaces all over the mouth, and they fit securely, like your smile’s missing puzzle piece. Full dentures replace a whole row of teeth on the top or bottom. Whatever denture option you choose, you can do so knowing you’re picking a trusted solution in tooth replacement. Call our Independence office or click here to request your appointment for dentures with Dr. Nakhla today!